For Halloween this year, Kate dressed up as a fairy, complete with a set of wings and a lighted skirt. Luke is into Star Wars now so he wanted to be a Clone Trooper, I think mainly for the gun. Kate was so concerned that the batteries for her lighted skirt were going to go dead that she wouldn't turn on the skirt until she was heading out for trick or treating. Our friends down the street, the Martinez family, threw their second annual Halloween party. The kids got a bite to eat, some play time and took turns at breaking open a pinata. Here's a shot of the kids getting ready for a group pic. Of coarse we didn't get a good shot. This is our cousin, sailor Levi enjoying party. Here's a shot of Kate with the Cope girls, Audrey and Lilly. After the party, it was time to go trick or treating. Cousin Jacob joined us for some candy gathering. Here's a shot of Luke, minus mask and gun because they got to heavy, running to the next house. They thought people were going to run out of candy. Hope everyone had a Happy Halloween. 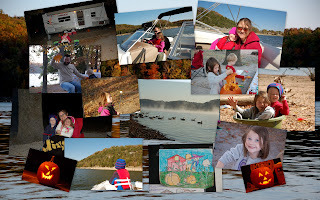 This past weekend we took what will probably be our last camping trip of the year. The days are getting colder and we're just pretty much booked up for here on out. We set up camp at Horseshoe Bend on the shores of Beaver Lake. Our spot was pretty nice being right on the water. The kids loved walking down to the shore line and throwing rocks into Beaver Lake, finding hiking sticks and collecting wood to burn. It's the simple things that make them the happiest. Our friends Doug and Tracey George stopped by on Saturday and picked us up for a boat ride to Hickory Creek for a little lunch. The Bluffs Restaurant actually turned out to be a pretty good place to eat. Highly recommend getting the brownie desert...good stuff! Luke and Kate even got to drive the boat for a bit which they enjoyed as well. Beth made the trip a halloween themed trip with her halloween table cloths, pumpkin light string and an evening of carving pumpkins. I was actually impressed with how much Kate helped clean out the insides of the pumpkins. Maybe next year she'll be able to do a little more of the carving. This past weekend our little girl turned five. Can't believe she's already five years old. 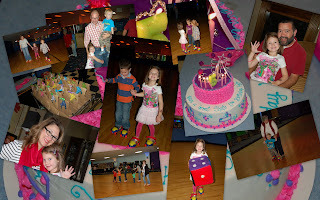 So for her birthday, Kate wanted to have a skate party. I think everyone had a good time skating. The kids played skating games, had pizza for lunch and cake to top it off. Happy Birthday, Kate! On Sunday, Kate's actual birthday, we headed up to Right Choices Corn Maze in Missouri. We haven't been up to this place in a couple of years and it looks like they added on a few more attractions. We pretty much did everything they had to offer. 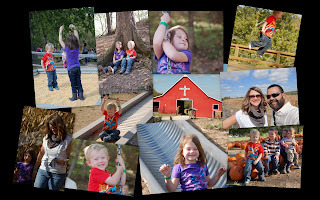 We walked the short corn maze, took a hay ride, and watched the kids ride the cow train, slide down the slides and swing on the tire swings. Luke even got to shoot the corn cannon and the kids bounced around on the bounce pad for a while. Good way to spend a birthday afternoon. Kate's first year of soccer season has come to an end. I believe she finished with 10 or 11 goals over the 8 game season, with a hat trick in one of those games. Kate had some reservation at the beginning of the year, but now she's sad that the season is over. We're so proud of her and can't wait for next season. Kate with her mad dribbling skills. Kate with her last goal of the year. Notice Luke is in the net, stuck in the net. Hope everyone is staying cool in this crazy heat. I'm ready for these 100+ days to go away, but I think we're just getting started. Well, we're staying cool here. We set up the sprinkler this evening for the kids and ended up finding a way to get the kids down the slip-n-slide. Good times!